Hawaii Conservation Stamp — The Department of Land and Natural Resources, Division of Forestry and Wildlife (DOFAW) is seeking entries in an art contest to depict hunters during a hunt for game birds and mammals for its 2017-2018 Hawai‘i Wildlife Conservation and Game Bird Stamp. The conservation stamp is required on the Hawai‘i State hunting license, and the game bird hunting stamp is required for those intending to hunt game birds. Both stamps (differing slightly in text) will be available to wildlife stamp collectors. 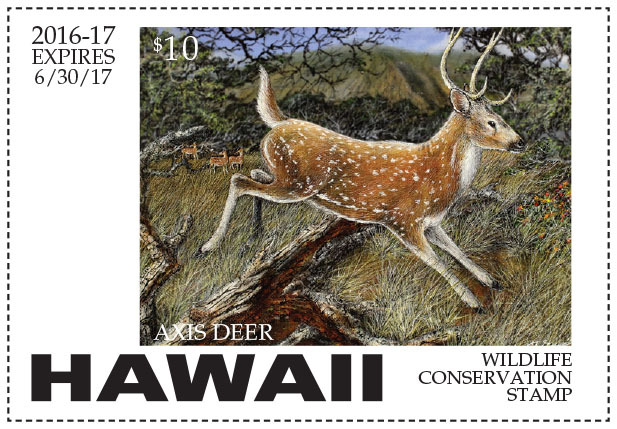 Funds from sales of the Hawai‘i Conservation Stamps go into the state Wildlife Revolving Fund to support wildlife populations and habitat, and to manage hunting in the state. Activities and projects supported by this fund have included surveys of game bird and mammal populations; land leasing for hunting; predator control; and maintenance of wildlife watering units. In addition, planting of native shrubs and trees, controlled burns, removal of invasive plants, and other wildlife habitat improvement and restoration projects are supported by these funds. Last year revenues from the Hawaii Conservation Stamp and the Game Bird Stamp were used to cover some of the costs of maintaining hunting units and to add game bird and game mammal hunting opportunities where possible. Funding helped pay for facility development, game mammal and game bird surveys, management of hunts, signage, paying commissions to vendors for the sales of hunting licenses, supplement game bird populations in new areas, to implement food crop plantings for game birds, to mow grasses and weeds to allow hunting, and to control predators like mongooses, rats, and feral cats, while proceeds from the sales of conservation stamp will also provide the funds for the annual lease rental of the Lana‘i Cooperative Game Management Area and several other hunting unit leases.